Increases in chloride concentrations were observed in 31 groundwater networks across the Nation. The online mapper examines decadal changes in 24 contaminants, such as nutrients, pesticides, metals, and volatile organic compounds. 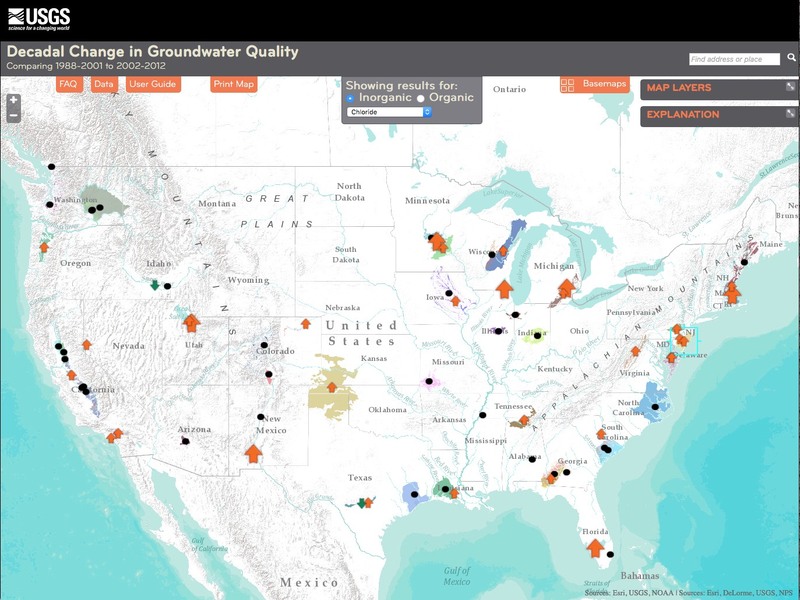 A new online interactive mapping tool provides summaries of decadal-scale changes in groundwater chemistry across the Nation. About 140 million people—almost one-half of the Nation's population—rely on groundwater for drinking water. Tracking changes in groundwater quality and investigating the reasons for these changes are crucial for informing management decisions to protect and sustain our valuable groundwater resources. 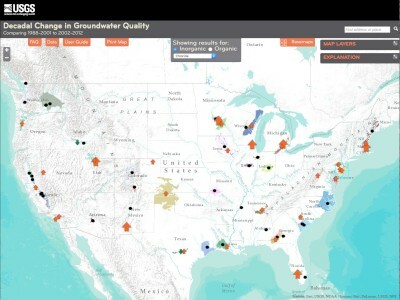 The interactive mapping tool is based on data from over 5,000 wells sampled between 1998 and 2001 in a series of 67 networks across the United States by the National Water-Quality Assessment Project. Each groundwater network consists of about 20 to 30 wells. Networks were chosen based on geographic distribution across the Nation to represent the most important water-supply aquifers and specific land use types. Learn more about the statistical approaches used to track decadal changes in groundwater quality. The U.S. Geological Survey (USGS) National Water-Quality Assessment Project provided the funds to develop the online tool.